Tysk litteratur efter `89. Foredrag om Uwe Tellkamp: Tårnet. V. freelance-germanist, ph.d. Hanne Roswall Laursen. Uwe Tellkamp reads from The Tower: Tales from a Lost Country. Uwe Tellkamp's book The Wall in My Head: Words and Images from the Fall of the Iron Curtain was available from LibraryThing Early Reviewers. 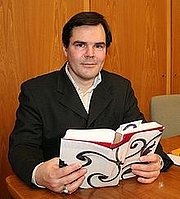 Uwe Tellkamp is currently considered a "single author." If one or more works are by a distinct, homonymous authors, go ahead and split the author. Uwe Tellkamp is composed of 1 name.